Web Design Process can be compared to that of building a house.First you need to understand the users, consider the landscape, then create and approve the blueprints and finally, … lay the bricks and add the finishing touches. Following our Web Design Process ensures that the website we build meets your objectives, works as it should in different browsers, is built according to usability and W3C standards and is search-engine friendly. Keyword Research prior to developing a website is absolutely essential. Without knowing your target keywords, your website content cannot be optimised for the search engines. 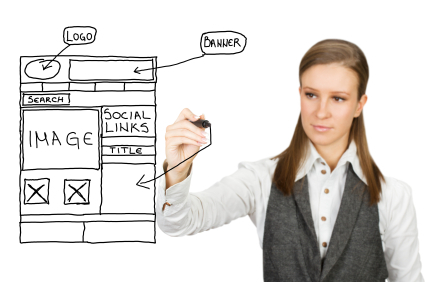 You also can not create an effective website structure. Keyword research is also essential for planning of an online marketing strategy . The internet is littered with websites that have never been promoted and are therefore never found by the search engines. Therefore, in our opinion, developing a website without developing an online marketing strategy, is a total waste of time and money. The Online Marketing Strategy chosen, affects, to a large degree, the whole website design. If you are going to sell via email marketing, you need a “squeeze page” that will collect you leads, rather than a traditional home page on an information/company promotion site etc. and how it influences Web design here. Many people rush with domain registration, registering the first name that appeals to them and is still available. Unfortunately, these domain names are often not great from either the SEO or branding perspective. You can learn more about the common pitfalls of choosing a domain name and domain name registration here. Website content can include many elements such as text, pictures, video, audio, slide shows, forms, links, buttons, calls to action and various graphic elements. The content of a website should be created and optimised around your targeted keywords. In creating the website content, you need to consider two distinctly different types of users – the human visitors and the search engine “spiders” that index and classify your content and position your web pages in the search results. This is the bricks and mortar step of the process. Using the pre-agreed wireframe as our blueprint, we create website pages, insert the content, graphics and navigation. During this stage of the Web Design Process, we test your website compatibility with different screens and browsers (e.g. Internet Explorer, Safari, Google Chrome, Firefox). We also make sure that any forms and active content works correctly and there are no broken links. The Search Engine Optimisation stage involves making sure that all the pages of your website have the appropriate H-Tags, Alt- Tags and other On-Page optimisation elements that make your web pages search engine friendly. You can learn more about the SEO process here. In this stage of the Web Design Process we also create a Site Map and submit it to various search engines for indexing.